Fish Replicas, reproductions of nature. Do not hesitate to e-mail or call for any questions or additional photos. Questions? Give us a call at 903 765-9999 or E-Mail Us! Museums, NOAA, U.S. Forestry Service, Texas Parks and Wildlife, ESPN, Skeeter Boats, G-Loomis, Bass Pro, Raising Cane's Shops are just a few of Companies and Organizations that have used FishReplicas.com. From Underwater Scenes to capturing your trophy (breaking, soaring, crashing) through the water a custom habitat by FishReplicas.com is the best way to set your trophy apart from all the rest! For over 20 years, the Pierce Bros. have been re-creating memories that last forever! We are glad you stopped in and invite you to get ready for a visual experience of a fisherman's dream! We painstakingly create replicas of nature. FishReplicas.com offers the highest quality in fish replicas today. 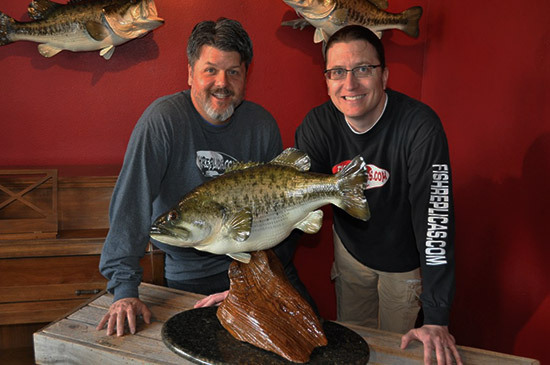 From Brazil to Alaska, the Pierce Brothers travel the world, casting molds to provide you - our Customer -the highest quality of fish reproductions available.